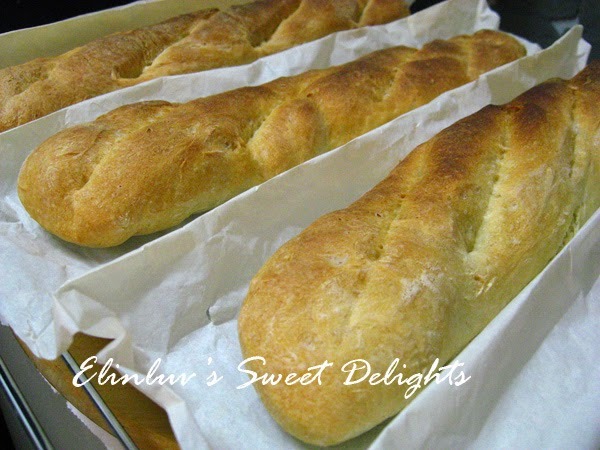 This is my second time making baguette and a different recipe. 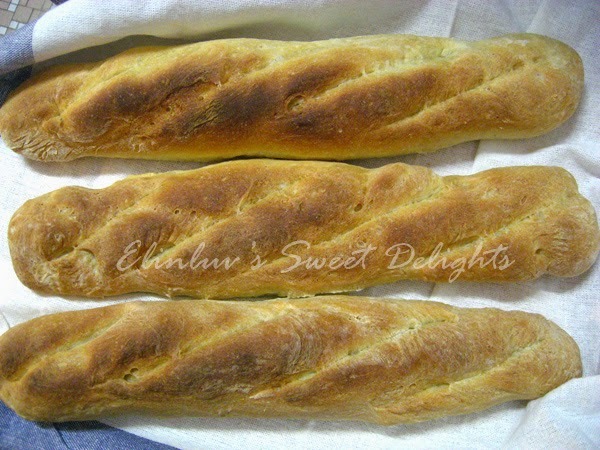 I kinda like this simple and easy method and the baguette turned out not bad. I like the crust and it could have a more artisan look if I had sprinkle flour on the surface before I baked them :) It has a crunchy crust and a soft inside when it comes out of the oven. Overnight it turned a bit hard and when I make a sandwich out of it, I just have to zap it in the micro for 30 sec and it will be perfect for making sandwiches like the 'Subway Sandwiches '. This method is easy and doesn't need much kneading. the 4 hours is the actually the time used for proofing ..knocking down and proofing again ...but worth waiting...the baguette is good * thumbs up ! 1. Whisk together water and yeast in a large bowl; let sit until yeast is foamy, about 10 minutes. Add flour, and stir with a fork until dough forms and all flour is absorbed; let dough sit to allow flour to hydrate, about 20 minutes. Add salt ( Figure A); transfer dough to a lightly floured work surface, and knead until smooth and elastic, about 10 minutes. Transfer dough ball to a lightly greased bowl; cover bowl with plastic wrap, and place bowl in a cold oven. Let dough rest until doubled in size, about 45 minutes. 2. Transfer dough to a lightly floured work surface, and shape into an 8″ x 6″ rectangle. Fold the 8″ sides toward the middle ( Figure B), then fold the shorter sides toward the center. Return dough, seam side down, to bowl. Cover with plastic again, and return to oven; let sit until doubled in size, about 1 hour. 3. Remove bowl with dough from oven, and place a cast–iron skillet on the bottom rack of oven; position another rack above skillet, and place a baking stone on it. 4. Heat oven to 475°. 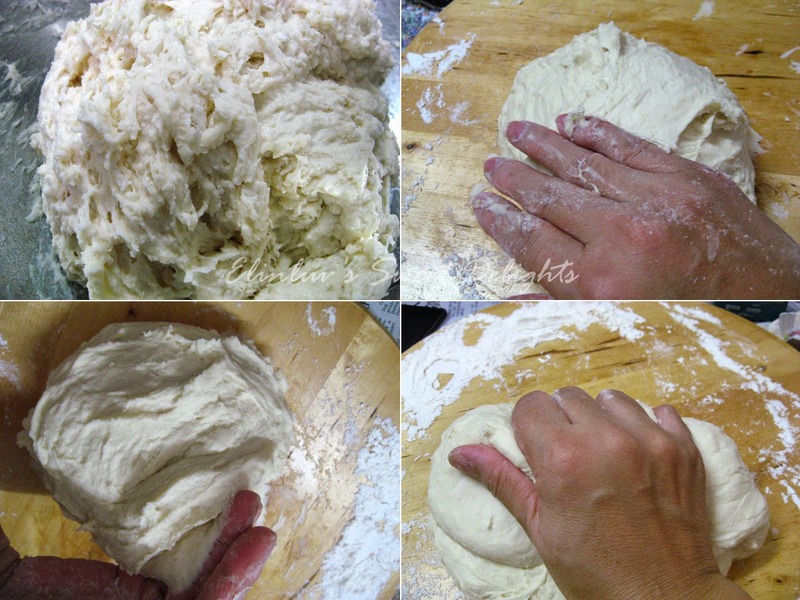 Transfer dough to a lightly floured work surface, and cut into three equal pieces; shape each piece into a 14″ rope (Figure C). Flour a sheet of parchment paper on a rimless baking sheet; place ropes, evenly spaced, on paper. 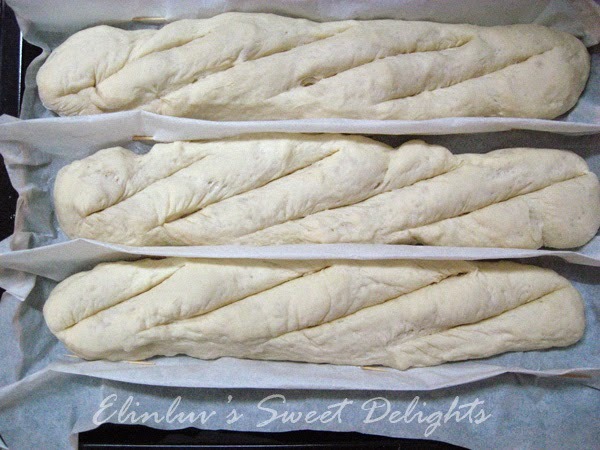 Lift paper between ropes to form pleats; place two tightly rolled kitchen towels under long edges of paper, creating supports for the loaves. Cover loosely with plastic wrap; let sit until it doubles in size, about 50 minutes. 5. Uncover; remove towels, and flatten paper to space out loaves. 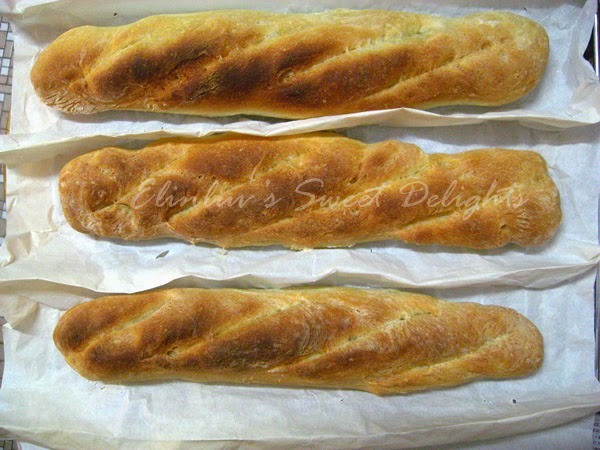 Using a sharp razor or paring knife, slash the top of each baguette at a 30–degree angle in four spots ( Figure D); each slash should be about 4″ long. Using the corner of the parchment paper as a guide, slide the loaves, still on the parchment paper, onto the baking stone. Place ice cubes in skillet (this produces steam that lets the loaves rise fully before a crust forms). 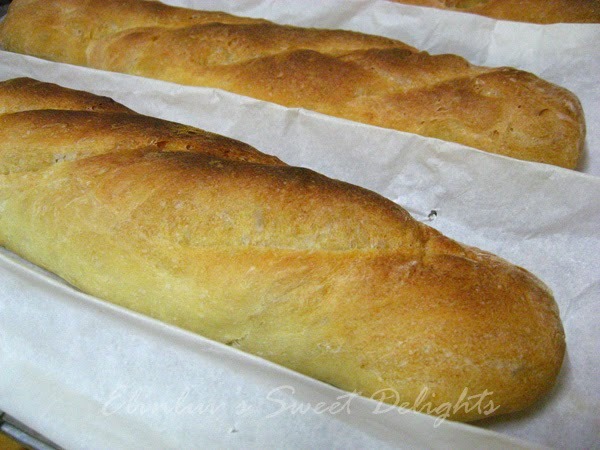 Bake the baguettes until darkly browned and crisp, about 30 minutes; cool before serving.